An old friend came back to me this week. 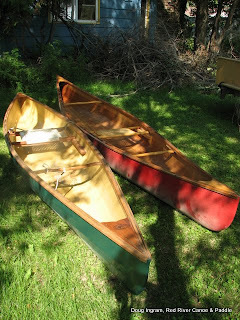 Canoe #5, the second canoe that I designed myself, built as a prototype with a friend who financed it, later sold it to a friend of his, who left it with his brother whose son was on the same swim team as my son, who got stuck with the canoe when his brother moved across the country, wanted to offload it, realized that I was the one who built it, emailed me to see if i would like it back...I said "Yes", of course! Asymmetrical design, 13' solo canoe. Plywood and fiberglass construction. Fast and fun. I learned LOT from this canoe. Some elements were successful, others not so much. When learning something new, you have to overshoot the mark to discovered how far back to go. On this one, mostly I learned how asymmetrical is the limit. Here, you can see it beside the prototype of the Elan, a successful solo canoe, especially for Freestyle, and the fruits of this endeavour. Posted by Doug Ingram at 9:33 a.m.